Skellig Michael is an outstanding, and in many respects unique, example of an early religious settlement deliberately sited on a pyramidal rock in the ocean, preserved because of a remarkable environment. It illustrates, as no other site can, the extremes of a Christian monasticism characterizing much of North Africa, the Near East and Europe. 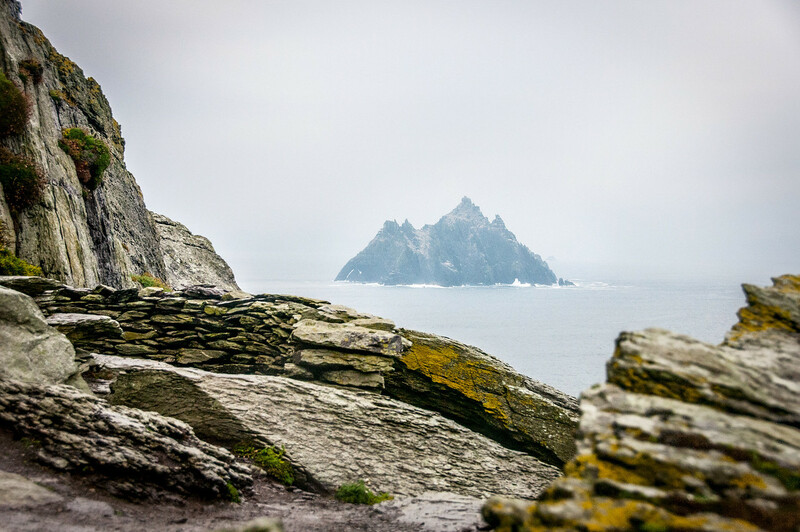 The island of Skellig Michael lies 11.6 km off Bolus Head, the westernmost tip of the lveragh Peninsula of County Kerry. Faulting of Devonian sandstone and gravels has created a U-shaped depression, known today as ‘Christ’s Valley’ or ‘Christ’s Saddle’, 130 m above sea level in the centre of the island, and this is flanked by two peaks, that to the north-east rising to 185 m and that to the west-south-west 218 m. The rock is deeply eroded and weathered, owing to its exposed position, but is almost frost-free. Landing is possible at three points, depending on the state of the sea. These communicate by flights of steps with the principal monastic remains, which are situated on a sloping shelf on the ridge running north-south on the north-eastern side of the island; the hermitage is on the steeper South Peak. The approach to the monastery from Christ’s Saddle leads to a long narrow terrace. A doorway in the rear wall gives access via a flight of Steps to a larger enclosure, which is in its turn terraced and subdivided; the lowest level contains the main monastic enclosure, comprised of a church, oratories, cells, a souterrain, and many crosses and cross-slabs. The white quartz paving between the buildings gives the ensemble an urban quality. The Large Oratory has the usual inverted boat-shaped form, with a door in the west wall. It is built from coursed stone, rectangular at the base and becoming oval as it rises in height; the elongated dome terminates inside in a row of large slabs. The Small Oratory is more carefully constructed, and is considered to be later in date. Nearby are the unique remains of a beehive-shaped toilet cell. Cell A is the largest of the six cells and must have had a communal function. Several have cupboards and projecting stones for hanging purposes. They vary in plan – square, rectangular, and D-shaped; several retain their original flagged floors. St Michael’s Church is rectangular in form, unlike the oratories, and would originally have had a timber roof. Two stages of construction can be identified: a small church in mortared stone was later expanded, using much larger sandstone blocks. Simply put, Skellig Michael (aka Sceilg Mhichíl) is fantastic. It is by far that most amazing thing I’ve seen in Ireland and in my book it is one of the top world heritage sites in all of Europe. It is also one of the more difficult to visit world heritage sites in Europe. 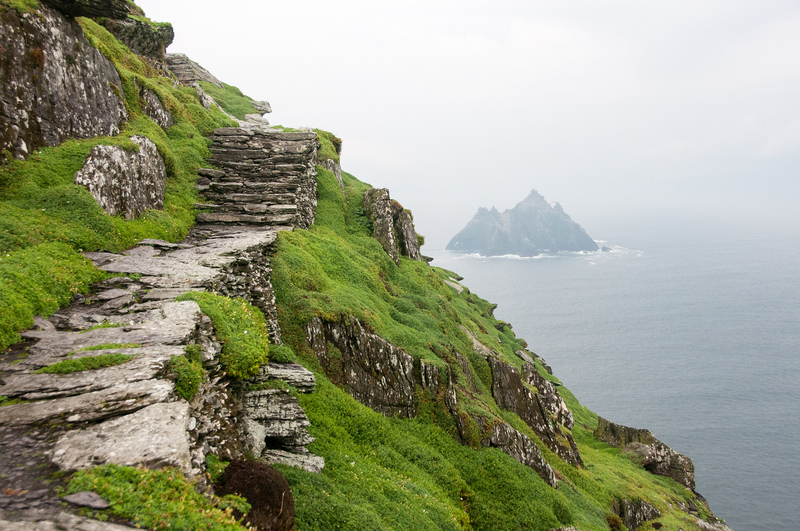 To get to Skellig Michael, you first have to get to the village of Portmargee in county Kerry in the extreme southwestern part of Ireland. Then you need to book passage on one of the boats which go to Skellig Michael. They don’t go every day due to weather and they are limited in the number of passengers they can take. Only about 50 people were on the island the day I visited. I don’t think the island can accommodate many more. 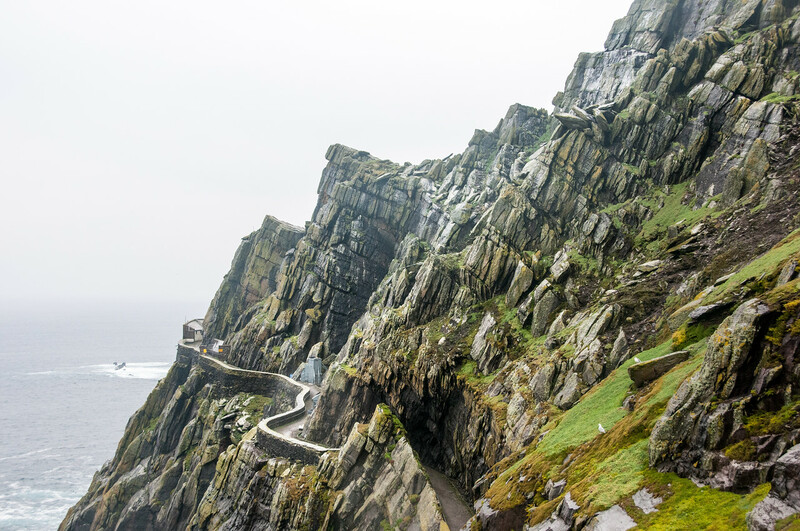 The difficulty of visiting is more a statement about how easy most European sites are to visit than how hard it is to get to Skellig Michael. Upon visiting, I was astonished that people ever managed to land on the island, let alone live on it. The rocks on the island are almost all vertical. If there wasn’t a modern platform for the ships to dock at, I don’t know how it would be possible to get on the island. That monks once lived here and created a small community is simply amazing. There is another small island near Skellig Michael called Small Skellig which can be seen in the above photo. It has no human presence and is covered with seabirds. If you are in Ireland, I highly recommend putting Skellig Michael near the top of your list of things to see. 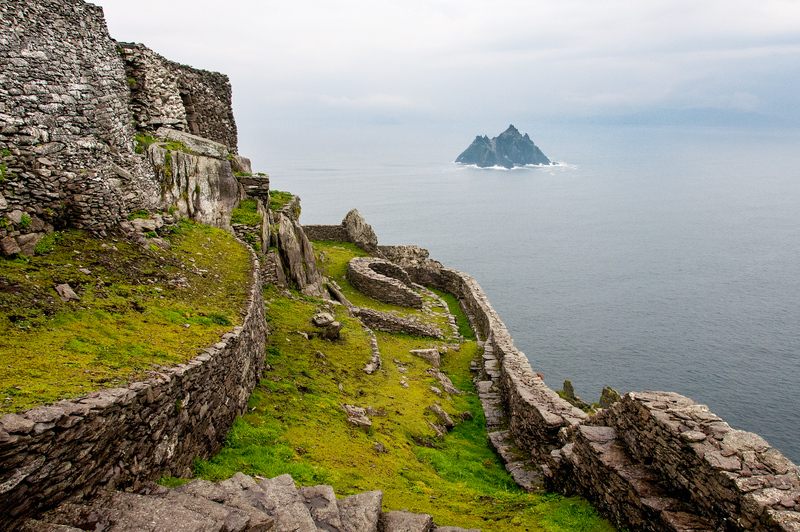 Sceilg Mhichíl, also known as Skellig Michael, is a cultural UNESCO World Heritage Site in Ireland. It was inscribed in 1996 as a cultural and religious structure, particularly linked with the Christian religion. This site consists of an early monastic complex that is situated on a steep rocky island that is difficult to access and remote. The Sceilg Mhichíl is built on an island called Great Skellig. It is located 15 kilometers west of County Kerry in Ireland. There are two main buildings that were constructed in Sceilg Mhichíl: Monastery and Hermitage. Prior to the founding of the monastic complex, Sceilg Mhichíl was uninhabited (apart from the mating birds). To this day, the exact date of the founding of the monastery at Sceilg Mhichíl is still unknown. It was in the 8th century wherein the first trace of monastic activity was recorded. However, there are also several claims that it was founded in the 6th century by Saint Fionan. The monastic site on Sceilg Mhichíl is located on a terraced shelf that rises 180 meters above sea level. This monastic complex was developed sometime in the 6th to the 8th centuries. The complex is composed of 6 beehive cells, 2 oratories, and a few stone crosses and slabs. There is also a medieval church on the island. Both the cells and oratories were constructed using the dry-built corbel method. After that, they developed a method for collecting and purifying water. According to records, there were about 12 monks and an abbot that lived on the monastery. 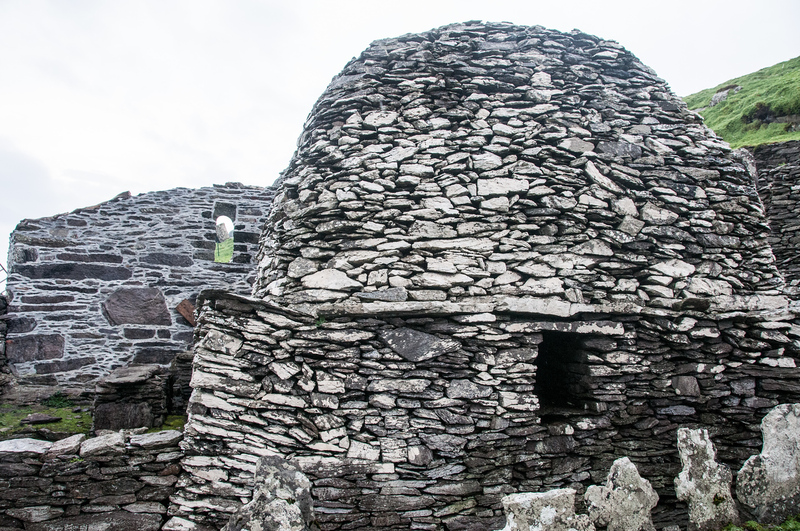 The Hermitage, which is another component of the monastic complex at Sceilg Mhichíl, is located on the south peak. Due to the remoteness of the monastery, the monks who lived here followed a unique diet. The location of the island in the North Atlantic means that they had access to different food sources from those on the mainland. They did not have the appropriate land to grow grains in, they had to make their own vegetable gardens instead. Aside from the vegetables, they also survived on fish and eggs of birds nesting on the island. The monastery was inhabited until the 12th to 13th century. This was during a time wherein the climate at Sceilg Mhichíl became colder and was constantly hit by storms. This period has also seen some changes to the structure of the Irish Church. Hence, the community of monks that lived on Sceilg Mhichíl was forced to abandon it. Aside from being named as a UNESCO World Heritage Site, Sceilg Mhichíl was also listed under the Special Protection Area. This was through the initiative of the Minister for Housing, Planning and Local Government in 2010. View my complete list of UNESCO World Heritage Sites in Ireland. Beautiful photo! I am a huge fan of mountains and open water. What a beautiful photo! Thanks for the inspiration on this one Gary! Gary, this looks like it belongs on my list of places to visit. Will you be posting any more pictures from here? I would love to see more. yes. This is just the first of many. Looks beautiful! Small Skellig – that’s cute.